One of the biggest rifts in American culture manifests just days into the month of November every year. First, it creeps onto store shelves; then, it hangs from street lights; and finally, it plays on the radio in cars—it is Christmas decorations and music before the Thanksgiving celebrations have been concluded. Some people demand that Thanksgiving be given its own dedicated time between Halloween and Black Friday without the interruption of Christmas music. They want to enjoy the autumn before the leaves have all fallen and the winter lull sets in– one way to accomplish this is to revel in the most autumnal holiday of the year by cooking a grand feast and gathering with friends and family. Feeling that the holiday does not get the attention it deserves, the presence of Christmas music and decorations plastered in stores and on the streets further engraves the threat to Thanksgiving lovers. As someone who has never truly chosen a side, this would likely be my own stance on the debate. Thanksgiving is my favorite holiday, so why not take the time to enjoy it? Jerika Brown, freshman Business Management major at Southern Nazarene University (SNU), takes a moderate stance on the issue. While she certainly is not a proponent of Christmas music before Thanksgiving, she does not mind the occasional Christmas song. It is when the classics get replayed that she takes issue: “When people start playing the generic Christmas music that you hear all the time, like ‘Frosty the Snowman’ and ‘Rudolph the Red-Nosed Reindeer,’ I want to throw a fight,” said Brown. Brown’s rationale is that those songs are already overplayed during the short Christmas season, so starting them early makes them tiresome sooner. So, she proposes the compromise that Christmas songs can be played, so long as they are not the classics and infrequent. 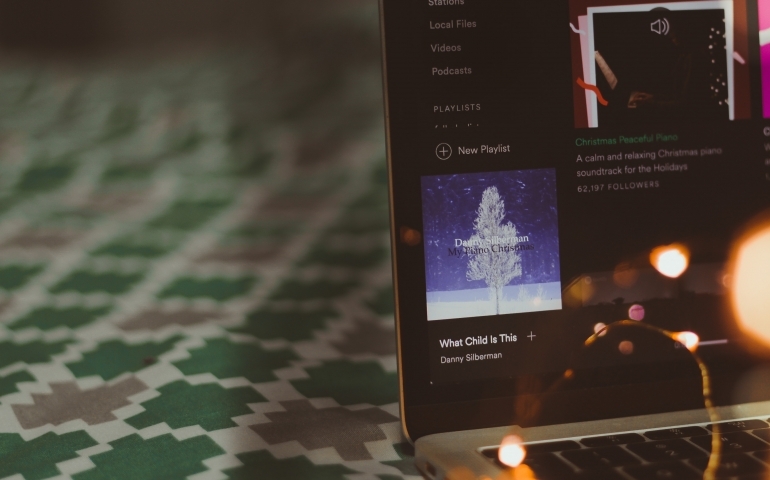 The newly-released Christmas songs by Christian artists fall into that mid-range category for Brown, who would be happy to listen to them before Thanksgiving. Stephanie Clements, a sophomore SNU student with a multidisciplinary major in Physics, Chemistry and Education, is a passionate participant in the enjoyment of both Christmas music and decorations before Thanksgiving. Clements finds common ground with Brown in the types of Christmas music that she listens to outside of the traditional holiday season. She said, “I mainly listen to Christian artists’ Christmas music collections.” This, of course, does not keep her from listening to the classics as well. “I celebrate the birth of my Lord and Savior, Jesus Christ, year-round,” said Clements of her early Christmas traditions. She acknowledged that the celebration of the holiday is something that has a seasonal importance, but also loves the joy that Christmas can bring at all times of the year. Thanksgiving is quickly approaching, as is the end of the routine debate. With two starkly different sides of the discussion and a massive gray area between, SNU students will all find themselves celebrating the order of Thanksgiving and Christmas festivities slightly differently from one another. But one thing that we can all agree on is that Christmas music or not, Thanksgiving break cannot come soon enough.